Starting from this month, we will be featuring the key personnel behind % Arabica to tell you their stories with coffee, % Arabica and their personal lives through 10 questions specifically tailored for them. For this month, we will have our brand founder and owner Kenneth to share his philosophy and vision for % Arabica, along with some untold and interesting anecdotes of % Arabica and his life. 1. How did your story with coffee start? I grew up in Tokyo and moved to Los Angeles after high school for college. During my six years living in LA, Starbucks expanded in the States rapidly, and I was one of the biggest fans. I used to buy all kinds of tumblers, mugs, and even plain white plates with Starbucks logo on the bottom!! 2. What was the pivot for you to start % Arabica? In Japan, the oldest son quite often takes over family businesses, and my father owned a chemical company which produces and trades offset printing consumables. I joined the company right after college, and took over the business when I was 35. In 2012, it was company’s 50th’s anniversary, and I wanted to start a new business, so I started two new businesses. One didn’t work out, but fortunately, the coffee business has been doing great so far. 3. How did you come up with the name % Arabica and logo “%”? I’ve always admired great Japanese brands like Sony or Toyota, and it was my goal for 40’s to start such a brand by myself and expand it to the world. So I chose a simple name ‘’Arabica’’ like Sony or Toyota for the brand. As for the logo, one day, I was looking at the “%” mark on my computer keyboard, and realized that it looked like coffee cherries on a branch, then I immediately thought I can make a global brand with this. From Instagram post on February 2, 2018. Many people call us ‘’Percentage Arabica’’ or ‘’Arabica Coffee,’’ but the actual brand name is ‘’Arabica.’’ We put % mark, because our logo is on the keyboard lol. 4. 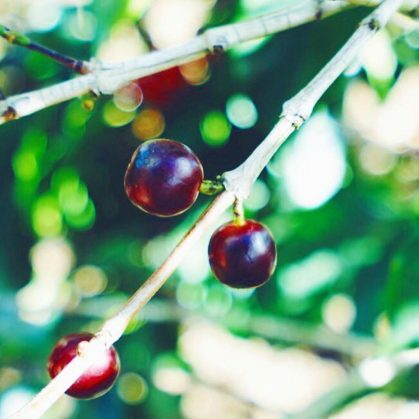 We know that when you started % Arabica, you bought a coffee farm in Hawaii. Why Hawaii? 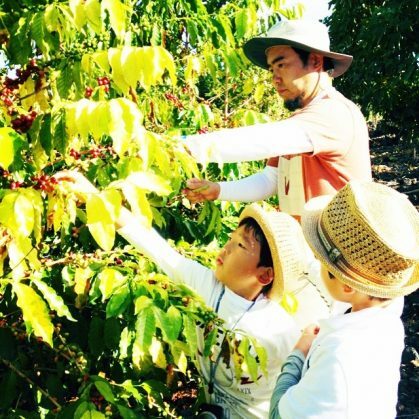 Kenneth and his sons picking coffee at % Arabica Farm. From Instagram post on August 19, 2014. 5. What was the biggest obstacle that you’ve encountered during the creation of % Arabica? Oh, the last five years has been a roller coaster ride, and so many things have happened, but I will give you an easy one. When I opened the first % Arabica store in Hong Kong in 2013, we had only two staff, a girl named Wannie and I. We worked two months without taking a day off, and we almost became ill. Luckily, the store was featured by many media, and we became busy from the beginning. During weekends when Wannie was off, I had to run the shop by myself, and I was so busy doing cashier, serving coffee and roasting beans. Hong Kong customers were incredibly nice, many of them even helped me wash cups and saucers lol. It was a great moment when I could hand over the weekend barista job to reliable staff later that year, and my kids were so happy to see me at home. The first year was crazy, as I was running chemical business and, getting the brand started and doing barista weekday and weekend all at the same time lol. 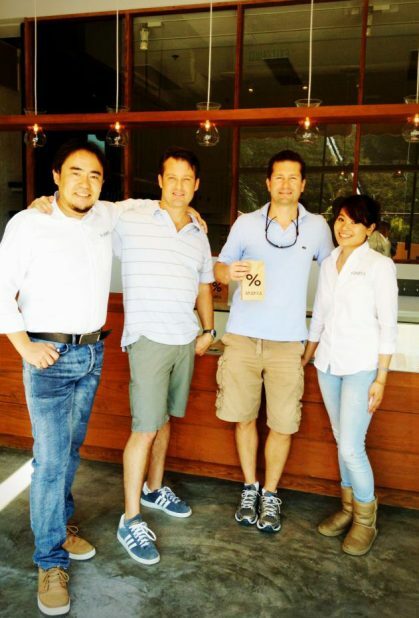 Kenneth (left) and Wannie (right) with % Arabica’s first ever customers. From Facebook post on February 1st, 2013. 6. How should one interpret “See the World Through Coffee”? Since I was young, my parents took me to many countries, and this is the reason why I’m kind of good at expanding the business to the world. I mean, I know the global standard. In Japan, there’s a word ‘’kenbun : 見聞’’ which means to see and to hear, and I believe young people should travel to increase their kenbun. Our slogan ‘’See the World Though Coffee’’ is based on this idea. I love to make this brand a platform for young baristas to see the world, find themselves and then challenge the world with what they are good at. 7. What is the biggest passion of your life besides coffee? I love interior design, collecting mid-century furnitures, and seeing different countries and cultures, so doing % Arabica is like playing for me. 8. What is your typical working day like? 9. What vision do you have for % Arabica in the next five years? How will you achieve it? 10. What is your ultimate goal with % Arabica? Our first goal is to become a sustainable global coffee brand by having our footprint all over the world, but with curated selections of locations. These days, the business trend is to grow rapidly and seek for a buy-out, but my Japanese heritage steers me away from that kind of mentality. I’ll grow this business carefully and pass it on to my sons, so the next goal is to become a timeless, long-lasting coffee brand. My last goal is to keep this brand as simple as possible. Good design, simple menu, and delicious coffee are the most essential pillars, along with the ability to provide opportunities for young baristas to see the world through coffee.